Have you got your very own Simon's Cat at home? Then this hooded litter tray is an absolute must. The red tray and white hood are made from quality plastic. The hood is decorated with amusing cartoon figures and there is a cute cat face on the swing door. The detachable hood has an integrated carbon filter. The hood attaches to the tray with snap locks so it is easy to remove when you want to clean the tray. The hygienic active carbon filter absorbs any nasty smells inside the tray and keeps everything smelling fresh and pleasant. There is an integrated scoop in the hood so it is always there when you need it. And there is also a practical handle so it is easy to move the entire litter tray. 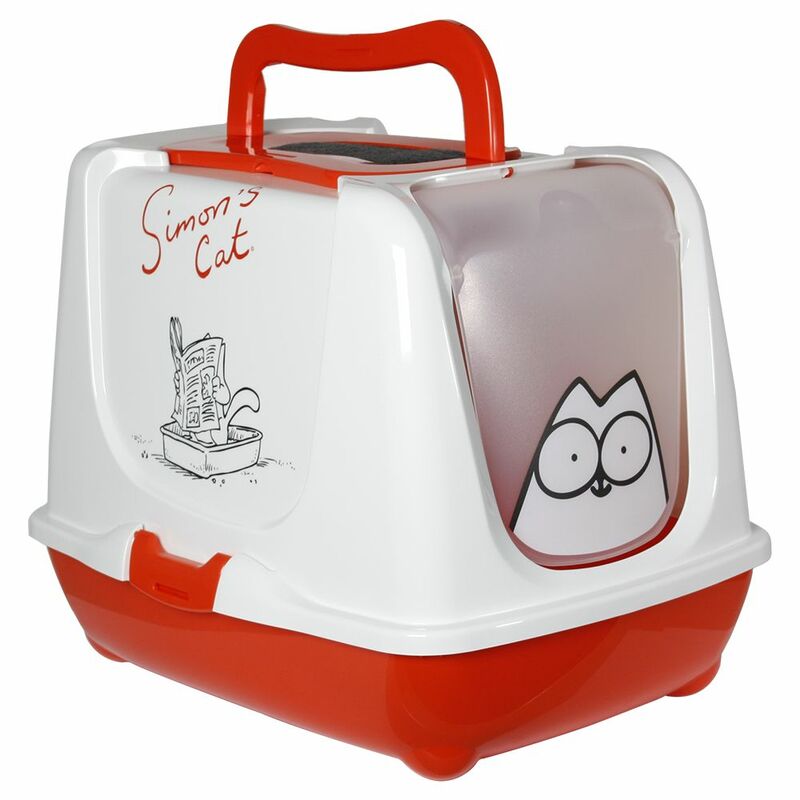 Simon's Cat Hooded Filter Litter Tray: Spacious covered litter tray From the Simon's Cat Collection of cat products: A real head-turner with a cheeky cat face on the door, bright red logo and funny cartoons. Litter scoop included: Integrated in the hood, so it is always to hand With active carbon filter:Absorbs any nasty odours. 1 filter included in delivery Swinging door flap made from opaque plastic Integrated handle in hood Dimensions: Total dimensions: 48 x 37 x 39 cm (L x W x H) Entry: 21. 5 x 25 cm (W x H) Tray height: 11.5cm Entry height (with hood): 14.5cm Entry height (without hood): 11.5cm Colour: Tray: Red Hood: White, filter cover and handle are red Simon Tofield, an English animator, created the charming and mischievous cartoon character Simon's Cat, inspired by the antics of his own four cats.